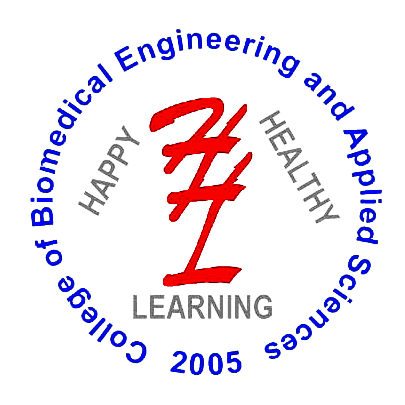 College of Biomedical Engineering and Applied Sciences is the only college in Biomedical Engineering in Nepal for exclusive courses on Biomedical Engineering. 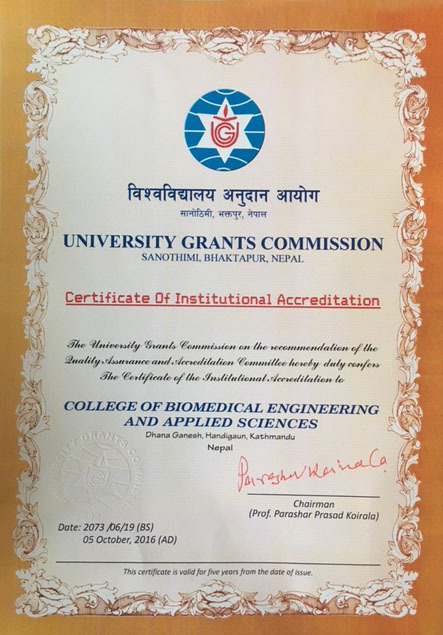 It is the only Engineering College in Kathmandu Valley and the only affiliated college in Nepal to receive certificate of Institutional Accreditation from the University Grants Commission (UGC Nepal). Due to its unique course with world class syllabus, our graduates are excelling in their fields in Nepal and abroad. Our graduates have already completed PhD and Masters programs from various prestigious universities worldwide and have received prestigious awards and scholarships. Application for Admission Open (2018). # Application for admission open ( 15th batch) in CBEAS for BE Biomedical Engineering. # Application forms can be obtained from the college (Account office). # Last date of submitting forms is Bhadra 13, 2075 (Wednesday) till 12.00 noon. # Entrance Examination date will be announced later. # Students with I.Sc. or 10+2 Science obtaining at least aggregate of 45% or C and not less than C in each subject are eligible to apply for the entrance examination held by Purbanchal University. Original and Photocopy of Mark Sheet and Character Certificate of SLC. Original and Photocopy of Transcript Certificate/Mark Sheet and Character Certificate of Certificate Level or 10+2 (Science) /I.Sc. Provisional and Migration Certificate of 10+2 (Science)/I.Sc. Please like our facebook page www.facebook.com/BiomedicalNepal/ for continuous information. You are welcome to visit the college during office hours.